Not all missions experiences are the same! 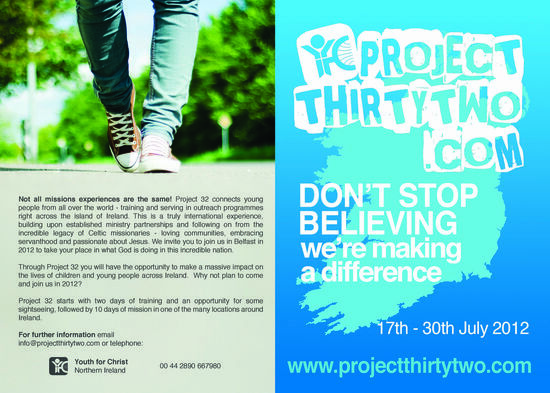 Along with Youth for Christ-Northern Ireland, I invite you consider what role you could have in PROJECT 32 in Northern Ireland and Ireland for next year. What a great experience we had this last summer… passionate people from around the planet gathering to take their place in what God is doing in an ancient and mystical land. What a profound opportunity to partner in some incredible life-building initiatives for 2012. So I've included in this post the initial promotional brochures for next year… Just click on them to enlarge the graphics. Then let me know if you're interested and would like to hear more about this creative, intelligent, multi-faceted and passionate approach to ministry with Youth for Christ. Romans 5:9-11 ~ How Much More?